Gov. McCrory has now bragged, with reference to the third largest coal ash spill in U.S. history, that "I know infrastructure [at Duke Energy] and I know management and I know engineering. Somewhere along the way there has been a breakdown in ensuring that site [on the Dan River] was properly maintained." 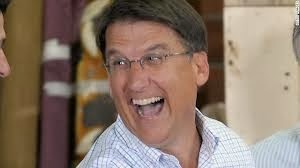 Does anyone within the sound of McCrory's mis-firing synapses really believe that he knows squat about engineering, or about anything else beyond smiling for the camera? "Customer service" = kowtowing to corporate polluters. Yep, North Carolina, your air and water is in good hands! That "expert" in infrastructure, engineering, and management is running everything! As one young man so eloquently said "Thanks for nothing Pat!" Works here too...as a matter of fact, can't think of a single issue that Pat didn't deserve the sentiment.